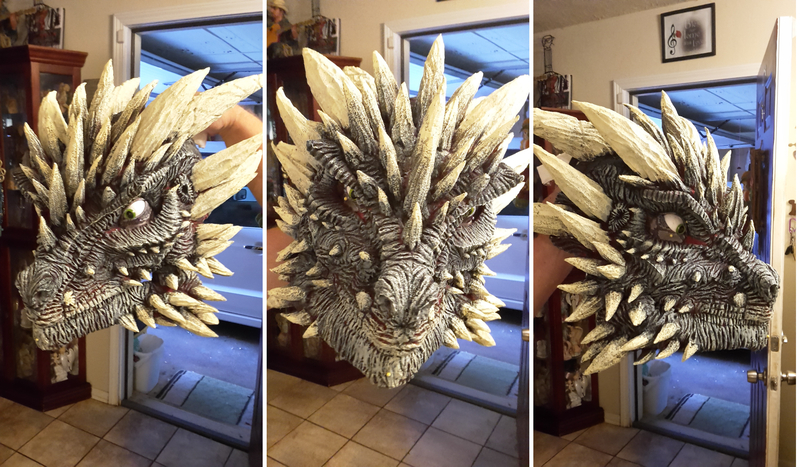 Here are a few shots of my (on going) dragon, shoulder puppet....I just finished most of the head, carved from upholstery foam over a foam board skull, sprayed with scarlet fabric dye and then sprayed with 1 can of rubber seal, then painted and highlighted with gray and ivory acrylic paints. The eyes are my inserts covered with snake skin spandex for lids. I have since added a bitless bridle of gold chain secured by nose ring. Eventually, it will have a movable jaw with balsa wood teeth and EVA foam tongue. Does the puppet class cover anything like this? Maybe make a flat negative scale mold on drywall with a drillmole and brush latex on it to get a skin.